It is exhausting trying to find rest. If you look to a person to provide rest, a safe place to hide, a security in an insecure world – they will fail you because they are fallible human beings. At their best, they are as broken as you are and looking to you to find rest. If you look to a job or career as a place a safety, security and fulfillment you may have seasons of it but economies change, companies change and you change. They are at best at temporary place of financial security. Even if you look to church to be a place of rest, it can fail you because the church is made of people. The Word says to find rest in God, not the church. You go to church to learn, grow, give, serve, bless, be blessed and so on. You go to Jesus for your salvation, your refuge, your direction, strength, peace and abundant life. The church points you to Jesus. 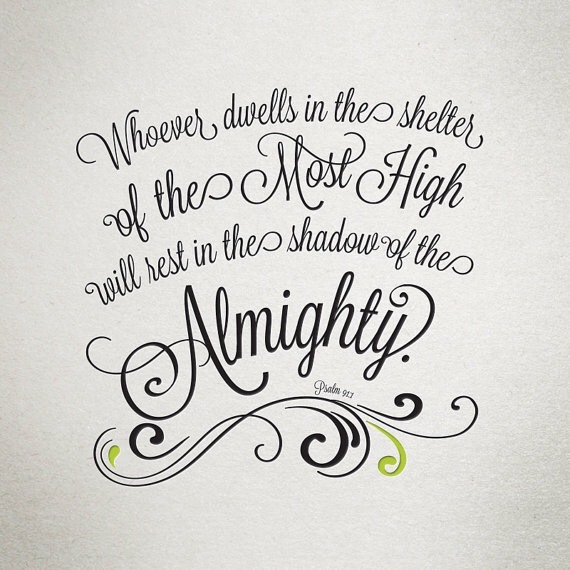 The only true place of refuge, security, peace and rest is in the shadow of the Almighty God. What does that mean? It means that you stick close to God’s side. So close in fact, you walk in His shadow. Follow where He goes, see the world as He does and do what you see Him do. Sounds a lot like Jesus doesn’t it? Jesus came to show you how to live so close to the Father that you bask in the shadow of the Almighty. Then he made it possible to live this way by going to the cross for you to pay the debt you could not pay. Jesus cleared the way so you can walk this close with God, your Father. He is your God and you can trust Him. He is your place of rest, not just when everything is going good but when everything is falling apart. He is your refuge when your tired of fighting the battle. He is your fortress when the battle is too much to take. So, my friend, whatever today brings – may you dwell in the shelter of the Most High God and stick so close that you live rested in His Shadow.